Profits from Talon Guitar Picks fund research and organizations dedicated to cleaning our oceans of plastic waste... so keep on rockin'! 4 unique models with increasingly angled Jazz style tips for ultimate string response and ideal contact. The dynamic design sculpts your delivery to unlock new realms of tone and sharpen technique. At any moment, rotate 90° into the flat pick position for that "open" strumming tone and feel. Craft molded with a natural thumb contour & raised grips, eliminate pick slipping and repositioning. As the guitar neck becomes angled, a flat pick tends to strike ACROSS the strings… and less UPON them. It is in this effect that layers of amazing tones and textures are hidden; where the intricate characteristics of your guitar, strings, pickups, amp, and pedals are not fully revealed. On the same course, picking technique can be diminished when string contact is poor or hand contortion becomes necessary… creating tension or wasted energy. As guitar angles and positioning should be dictated by pure feel and comfort, we can now utilize a non-slip guitar pick design that channels our own unique delivery. Welcome to Talon. The unique design of the Talon delivers 4 dynamic models, armed with an increasingly angled picking tip extending from a flowing thumb contour. Each progressive angle of the Talon tip disperses more direct contact energy (“bite”) upon the string, which limits the amount of skip across the string (“release”). Now you are able to reign in YOUR ideal amount of attack and response. As you ascend through each model of the best guitar picks on the market, you will hear and feel how the design will reveal new tones, tighten sonics, and unleash picking techniques. Easily rotate 90˚ to ever access the traditional flat pick for that open strumming feel and tone. Couple the Talon design with 3 custom blends of topflight materials… and you now have an array of pathways to deliver your finest sound. 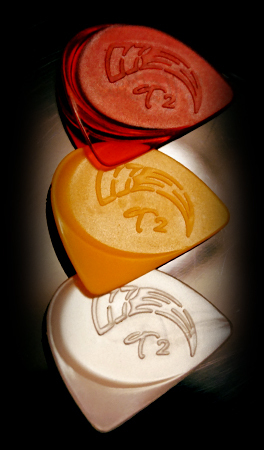 If you are considering various guitar picks online, there is one choice if you are serious about improving your tone.